There are Five personal parameters which provide effective data for complete comprehensive body analysis, Age, Gender, Height, Weight, and Biological Resistance. We have divided age into two categories Adult and Child, this should be set in your personal parameter user setting (1-4) along with your gender, and height. The scale will measure your weight and biological resistance to determine your Body Fat % using the BIA (Bioelectrical Impedance Analysis) method. The following is an illustration of how your Body Fat % is calculated. In this system, two footpad electrodes (pressure contact points) are incorporated in the platform of a precision electronic scale. The subject’s measurements are taken while in a standing position with the electrodes in contact with bare feet. The body fat analyzer automatically measures weight and then impedance. 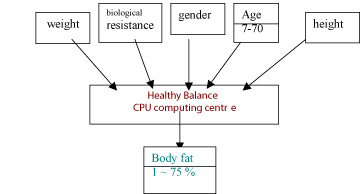 A microprocessor imbedded in the product uses the data inputs to determine body fat percentage based on equation formulas that have been programmed into the microprocessor. There is no international standard of methodology in calculating body fat. The WHO (World Health Organization) sets guidelines for general impressions of proper body composition given gender and age. The BIA method to measure fat is the most user friendly and efficient process available today to the average person. The BIA method is purely a calculation of variable inputs and different manufactures may use different calculation methodologies that may result in differing results between different manufactured scales and body fat analyzers. As such, your body fat percentage is for reference only and should be tracked with one device only for accurate results against the Body Fat Ratio Chart provided. For increased accuracy in results, please set the scale in accordance to the appropriate category of the active user. Child Mode: For those up to age 18. Adult Mode: For those 18 or older who have inactive to moderately active lifestyles. Athlete Mode: For those who exercise around 10 hours a week and have a resting heart rate of 60 beats per minute or less (not intended for professional athletes or bodybuilders). Please note that the BIA method may tend to compute body fat percentage incorrectly (i.e. overestimate) amongst adult, professional athletes. This is because of physiological differences such as muscle density. Do not use BIA body fat monitors if you have implanted medical devices. Take measurements under the same conditions, at the same time of day, over a period of time. Make sure you are hydrated for best results. If you are dehydrated, the amount of fat can be overestimated. Wait at least two hours after exercise, showering or eating before taking a measurement.